ISS crossing the Moon, time-lapse image. 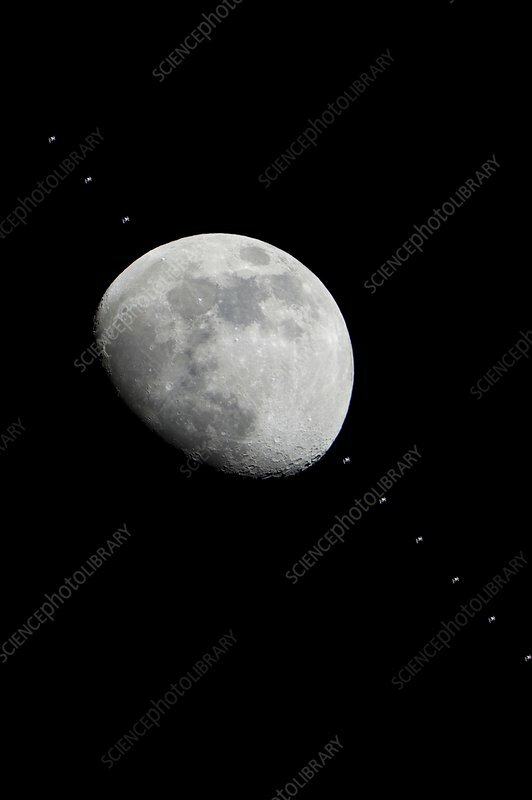 The International Space Station (ISS; upper left, lower right, and crossing the Moon) is orbiting the Earth here at an altitude of around 390 kilometres. The Moon orbits the Earth at a distance of around 385,000 kilometres, nearly 1000 times as far, but is far larger, being around 3480 kilometres across compared to the ISS width of around 100 metres. The ISS takes a few minutes to cross the sky, orbiting the Earth every 92 minutes. The Moon rises and sets daily due to the rotation of the Earth, taking just over 27 days to complete its orbit. Photographed 4 January 2012 from Houston, Texas, USA.